The government is about to announce another raising of the floor standards for Year 6 SATs results in England’s Primary Schools. This will result in yet more schools being potentially unfairly labelled as failing and becoming ripe for takeover by an academy sponsor. No-one could reasonably disagree with a desire to see schools improve and children’s prospects do likewise but policies like this one simply push already improving schools below a seemingly arbitrarily decided standard whilst doing nothing to change the education system for the better. Once again it appears to be motivated by a misplaced reliance on the Academy system and will be used to force more schools down this route against their will. 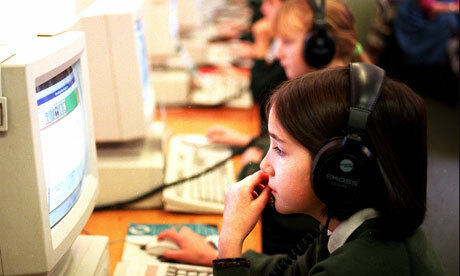 Hundreds more primary schools in England risk being labelled failures after the coalition set stricter targets. David Laws, the schools minister, will tell an education conference on Tuesday that primaries will be deemed to be under-performing from 2014 if under 65% of their pupils reach a satisfactory standard in reading, writing and maths and their school fails to achieve above-average progress in these subjects. Until now, primaries have been said to be “below the floor target” – or under-performing – if under 60% of pupils reach a satisfactory standard in reading, writing and maths and pupils do not make above-average progress in these subjects. Under-performing schools risk being taken over by an academy sponsor. Government officials said schools improved when targets were made tougher. Last year, 476 primaries were under-performing against 1,310 in 2011. Fewer than 900 primaries could be deemed to be under-performing under the new stricter target. However, Russell Hobby, general secretary of the National Association of Head Teachers, said the government was “always shifting the goal posts” and that this would “do little” for standards. “England’s primary schools have been improving steadily for many years, nearly doubling the rate of children leaving with the expected standards,” he said. “There is no lack of ambition. The expected reward for that performance is always a shifting of the goal posts, so it will be no surprise to heads that the floor standard is shifting again next year. Raising the bar while reducing resources will, however, do little for standards. Laws will also tell the Association of School and College Leaders that experts will help schools work out how best to spend pupil premium money if a school is judged to be anything less than “good” by Ofsted inspectors andis not narrowing the gap between disadvantaged pupils and their peers. Schools receive the £600 premium for each pupil from homes where the joint income is less than £16,000 a year. 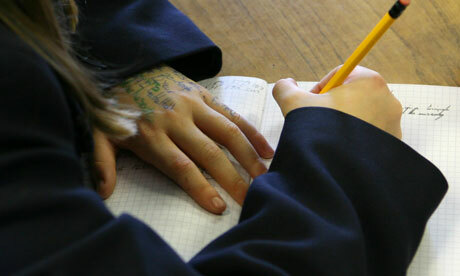 Primary pupils are expected to reach level four in reading, writing and maths by the time they leave secondary school. 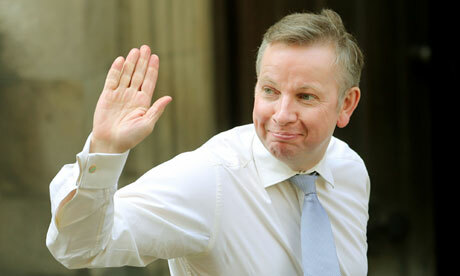 From December, the government will publish the proportion of primary pupils who achieve a “good” level four. This is so that parents know whether pupils are just making level four or exceeding it by some margin. Academies are in the news once again this week with an announcement by David Cameron, of the Government’s intention to convert 400 weak primary schools into academies in time for the 2013 academic year. We have two concerns with this announcement. Firstly, as we have discussed previously, academic status isn’t a panacea for failing schools. There are a wide variety of methods that can be and have been used successfully to turn around failing schools that don’t involve the very expensive restructuring involved in conversion to academic status. Hundreds of millions of pounds for academy conversion purposes have been removed from a depleted education budget leaving other schools short of funds. Conversion to academy status isn’t a successful policy for all schools and shouldn’t be regarded as such. Secondly, with the Government constantly shifting the goalposts in order to undermine schools and cause them to fail it appears that there is an ideological purpose behind the drive to convert all schools into academies even if it is against their will and not in the best interest of the students and that should be a cause for concern for all parents and right minded individuals who care about the future of the children of this country! The government will improve the UK’s 400 weakest primary schools by turning them into academies, the prime minister will say. David Cameron will announce on Monday that by the end of next year he wants the schools to be paired with sponsors to turn them into academies as part of coalition efforts to improve education in the poorest-performing schools. The move comes as the cabinet prepares to attend a special meeting at an academy later. Cameron will say: “The driving mission for this government is to build an aspiration nation, where we unlock and unleash the promise in all our people. A first-class education system is absolutely central to that vision. “We have seen some excellent progress with our reforms, including turning 200 of the worst performing primary schools into sponsored academies, and opening more academies in the last two years than the previous government opened in a decade. “Time and time again we have seen how academies, with their freedom to innovate, inspire and raise standards are fuelling aspirations and helping to spread success. So now we want to go further, faster, with 400 more under-performing primary schools paired up with a sponsor and either open or well on their way to becoming an academy by the end of next year. At the previous general election, there were 203 academies but they were all secondary schools. There are now 2,456 academies and a further 823 in the pipeline. Of the new academies, 333 were formerly failing primary or secondary schools. Ministers plan to spend up to £10m to develop new sponsor links. Children as young as five will be expected to learn and recitepoetry by heart in a major overhaul of the national curriculum for schools in England. The education secretary, Michael Gove, will promise a new focus on the traditional virtues of spelling and grammar when he sets out his plans for the teaching of English in primary schoolslater this week. At the same time, Gove will put forward proposals to make learning a foreign language compulsory for pupils from the age of seven. Under his plans, primary schools could offer lessons in Mandarin, Latin and Greek, as well as French, German and Spanish from September 2014. Gove is said to be determined to make the teaching of English at primary school “far more rigorous” than it is at present. He also hopes to reverse the decline in pupils taking foreign languages at GCSE by making them mandatory for the first time at primary school level. Ministers believe that equipping children with foreign language skills is essential if they are to be able to compete in a global economy and support economic growth in future. Officials acknowledge the proposals are likely to be controversial with some people arguing that they are too demanding while others will feel they are not demanding enough. Gove is said to be keen to promote a public debate on the plans before redrafting them for a formal consultation later in the year. They follow a report on the future framework of the national curriculum in England drawn up by an expert panel chaired by Tim Oates, the director of research at the Cambridge Assessment exam board. On the teaching of English, the aim is to ensure that pupils leave primary school with a strong command of both written and spoken English, with high standards of literacy. It will call for a systematic approach to the teaching of phonics as a basis for teaching children to become fluent readers and good spellers. It will also emphasise the importance of grammar in mastering the language, setting out exactly what children should be expected to be taught in each year of their primary schooling as well as lists of words they should be able to spell. At the same time the study of poetry will become an important part of the subject at primary school level. From Year 1, at the age of five, children will be read poems by their teacher as well as starting to learn simple poems by heart and practise recitals. The programme of study for Year 2 will state that pupils should continue “to build up a repertoire of poems learnt by heart and recite some of these, with appropriate intonation to make the meaning clear”. More generally the curriculum will place a much stronger emphasis on reading for pleasure with children from Year 1“becoming very familiar with key stories, fairy stories and traditional tales”. All children are to be taught a foreign language – which could include Mandarin, Latin or Greek – from the age of seven under reforms to the national curriculum being unveiled by the education secretary, Michael Gove. In other reforms, children will be encouraged to learn science by studying nature, and schools will be expected to place less emphasis on teaching scientific method. The introduction of compulsory language teaching in primary schoolsis intended to reverse the dramatic decline in takeup at GCSE. Pupils will need to be able to speak in sentences, with the appropriate pronunciation, and express simple ideas clearly in another language. They will be expected to develop an understanding of the basic grammar of the language, and be acquainted with songs and poetry. Ministers say that teaching should focus on making “substantial progress” in one language. The science curriculum is expected to emphasise using the natural habitat around schools – learning biology by studying the growth and development of trees, for example. The curriculum reforms will result in more demanding lessons, and represent a return to the basics of each subject. In maths, the teaching of statistics at primary school will be slimmed down to make way for more mental arithmetic. Children will be expected to do multiplication and division with large numbers without the use of pen and paper. Pupils in the final year of primary school will be introduced to algebra. The new programmes of study, which are being published for consultation this week, are to be introduced in schools in September 2014. They follow a report on the future framework of the national curriculum in England drawn up by an expert panel chaired by Tim Oates, director of research at Cambridge Assessment, an exam board. One of the most far-reaching proposals is a plan to scrap the levels that children are awarded in Sats tests at the end of primary school. The percentage of pupils reaching level 4 is used to determine whether a primary school is failing. It is not clear what will replace Sats levels. Scrapping them may pave the way for schools to provide more specific details of pupils’ progress in subjects. In English, the curriculum will emphasise the importance of grammar. For the first time, the government will set a list of words that all children must learn how to spell. These will include bruise, destroy, ridiculous and tyrant. Pupils will be expected to learn poems by heart and recite them in public. They will also be taught how to debate. The new English curriculum will say that by the end of year 4, children should be listening to and discussing a wide range of fiction and nonfiction. There is also greater stress on learning to read through phonics. The shadow education secretary, Stephen Twigg, said the government was “absolutely right” to make the learning of foreignlanguages compulsory from the age of seven. On BBC1’s Sunday Politics programme, he urged ministers to go further. “Children will get a love of learning languages if they get the chance to learn them younger. The government’s talking about seven. I would encourage schools to start teaching languages younger than seven,” he said. The number of primary schools teaching languages has been increasing in response to a target set by the previous government., though school inspectors say headteachers’ monitoring of language provision can be weak. This is often because primary heads feel they lack competence to judge language provision, Ofsted says. Languages have collapsed at GCSE since they were made optional at the age of 14. In 2010, just 43% of GCSE candidates were entered for a language, down from 75% in 2002. Standing at the first-floor window, we can see a graphic illustration of the school’s major problem laid out below us. Those fields are now completely covered by four mobile classrooms, a children’s centre and an early-years block. Where there used to be a playground, there’s now a dining hall for 500 pupils – far too small; it takes nearly two hours for the whole school to eat lunch. There are two more mobiles on the teachers’ car park, and, last year, the library had to be wedged into a windowless temporary building in an alley to make way for yet another extra class. This year, the music room has to go; next year, a few remaining flower beds will make way for four permanent classrooms. Welcome to what is – according to the latest official statistics – England’s biggest primary school. In a couple of years’ time, when two extra classes finish working their way up through the school, there’ll be more than 1,200 pupils. Gascoigne was always a big school. When Garton became head of the newly combined junior and infant schools in 1999, there were 700 pupils here – nearly three times the average number for a primary school. It must be hard for its staff to imagine how it could ever have been that small. It now feels like several schools on one site, each with its own fence and its own little playground. Most of the children are taught in single-storey blocks, built in the 1970s to replace an old Victorian school, and their corridors seem to go on for ever. Growing pupil numbers are not the only issue with which Gascoigne primary has to grapple. There are 60 different languages spoken here – the major ones are Lithuanian, Portuguese and Albanian – and the turnover of families is huge. 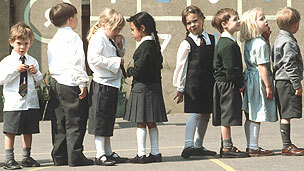 Four out of 10 pupils leave in the course of each year, and very few stay from age five to 11. The school website says, rather touchingly, that there are “approximately 984” pupils, but that’s well out of date. They are counted weekly, and last Thursday, there were 1,085. Gascoigne is not alone in grappling with increasing numbers. According to the Department for Education, there are a growing number of these super-schools, particularly in London and other major cities. By 2020, there will be an extra 800,000 pupils in English primary schools, bringing the total close to five million – a 20% increase in 10 years. And it’s acknowledged that the number of these “Titan schools”, as they’re being called, is bound to grow. 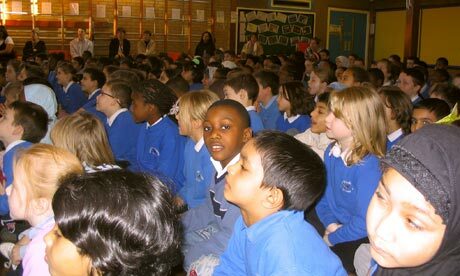 By 2015, there’ll be primary schools with more than 1,000 pupils in no fewer than seven London boroughs, and also in Birmingham. Local authorities say they’ve been left with few options but to expand existing schools. The Department for Education has promised£4bn to tackle the problem, but in many areas there isn’t the space, let alone the money, to build new schools. In Birmingham, the birth rate rose by 25% between 2000 and 2007, and those children are now arriving in school. Brent council, in London, recently published a report saying it would need an extra 23 primary classrooms in the next few years, while in Barking there was discussion about whether a disused Woolworth’s store could be used for teaching. Others disagree. David Simmonds, chair of the Local Government Association’s children and young people board, admits there are huge pressures – London councils have to build the equivalent of around 200 primary schools in the next few years to cope with increasing numbers. But “Titan schools” are part of the answer, he says – not all parents want their children to go to small, intimate primary schools. Simmonds is deputy leader of Hillingdon council in London. One of its largest primary schools is Pinkwell, which currently has 985 pupils and will expand to 1,200 in the next few years. Its vice-chair of governors, Dominic Gilham, says the decision to expand wasn’t a hard one. Unlike Gascoigne, Pinkwell is well endowed with large playing fields, and finding space for an extra class in each year group won’t be a problem. The increase, which will make Pinkwell as large as an average secondary school, will bring benefits, such as non-teaching maths and English co-ordinators, says Gilham, as well as challenges. “After discussions with parent governors, we felt it would be for the benefit of Pinkwell and the pupils,” he said. “A parent suggested we have small schools within the large one, so we have clearly defined areas for different ages, and a deputy head in charge of each key stage. It has a small-school feel,” he says. Gascoigne has a similar approach. Walking around the school, it’s hard to believe it’s as crowded as it is. The atmosphere is calm, and although the buildings seem vast, each small space within them feels welcoming. It’s raining today, and in the year-1 classroom children are doing exercises to a video instead of going out. And Garton seems remarkably calm and cheerful. His school has been rated good by Ofsted, with particular praise for the caring way in which it handles its newcomers and vulnerable pupils. There are advantages to the remarkable population his school has, he says– recent migrant parents tend to be very respectful of teachers, and are often ambitious for their children. Several different ethnic communities run their own Saturday schools here. By Sean Coughlan BBC News education correspondentA growing number of primary schools will have 1,000 pupils or more – as extra classes are added to cope with a rapid increase in the birth rate.Instead of one or two classes in each year group, there are plans for some schools to have six forms in each year. The Local Government Association says councils would “step up to the plate” to ensure enough primary places. The Department for Education says it is providing £4bn for areas “facing the greatest pressure”. It is also relaxing building regulations so that new schools can occupy a smaller space – secondary schools by 15% and primary schools by 5% – but the DfE says this has nothing to do with the shortage of places. 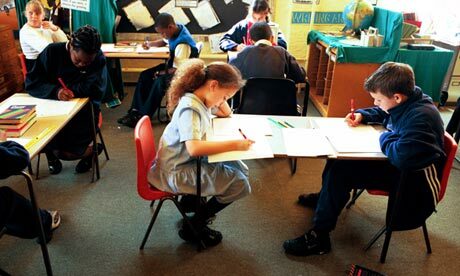 Supersize schoolsThe rise of supersize primary schools reflects urgent efforts to find places for the surging numbers of pupils – with official figures showing that an extra 455,000 places will be needed in England by 2015. If expansion proposals are implemented it would mean Birmingham, Brent, Waltham Forest, Newham, Redbridge, Hillingdon, Bromley and Barking could all have examples of primary schools with capacity for about 1,000 pupils and in some cases up to 1,200. There are many more schools which will be expanded to take 90 or 120 pupils in each year, with proposals for some schools to double their intakes. Brent Council, in north London, has published a report showing it will need another 23 classrooms. It already has more than 500 primary age children which are not placed in any school – enough to fill a traditional size school. An earlier report included a shortlist of four primary schools which would have capacity for more than 1,000 pupils by 2014-15. A spokesman said Brent Council was doing “absolutely everything it can, working closely with local schools, to create more spaces… but it is a real challenge”. Spikes in populationEarlier this week, John Howson, a research fellow at Oxford University’s education department, described the shortage of primary places as the “biggest problem” facing the school system. The shortage is not only in the biggest cities – there are pressures in places such as Winchester, Bristol and Bournemouth. But compounding the challenge is that the pattern of population growth is very uneven – with a surplus of places in some parts of the country. There are even big differences within cities. In Birmingham, the birth rate rose by 25% between 2000 and 2007. But within this average, there are wards with a primary-age population projected to rise by more than 50% and others where there is zero increase expected. In response to such local pressures, there are plans for Nansen Primary in Birmingham to expand from 630 pupils to 1,260 – which means moving to six forms per year group. There have been many different local proposals to finding enough space for extra pupils – including temporary classrooms, converting empty shops, developing split-site schools and in Barking there was a suggestion for pupils using a building in different shifts. But it is also putting pressure on parental choice. In response, Tower Hamlets in east London is considering changes to its admissions policy for next year, including a system which would recognise how far children would have to travel to their next available place if local schools were full up. It also means a distinct change in the image of a typical primary school. Between 1950 and 2010, the average size of a primary school in the UK remained relatively constant, in a narrow range between 180 and 220 pupils. There were also 5,500 more primary schools in the early 1970s, when there was last such a demand for places. David Simmonds, chairman of the LGA’s Children and Young People Board, says much bigger primary schools are now going to become“less unusual”. But Mr Simmonds, deputy leader of Hillingdon Council, is confident that local authorities will be able to cope with the pressure. The decision to expand existing schools in urban areas, where land is scarce and expensive, is often the most practical way of creating more places, he says. In rural and suburban areas, there might be more opportunity for new schools. The response of parents can vary, he says, in what is an“emotive” subject. Parents wanting to get children into an oversubscribed school might welcome the creation of more places – while those at the school might be less enthusiastic about such major changes to pupil numbers. There can also be practical questions such as parking congestion around schools, he says. The response from parents to previous stories on the BBC News website also shows that there are supporters of bigger schools – with emails arguing that they provide the capacity for more activities, sports and specialist staff. Head teachers’ leader Russell Hobby backed the expansion of existing schools as the best response to the places shortage. “However, there are limits to how far a primary can grow and still retain the ethos that makes it special and welcoming to young children. Primary heads are more than capable of handing the logistics, but it is the culture and pastoral care that are at issue,” said Mr Hobby, leader of the National Association of Head Teachers. The shortage of primary places also runs across political fault lines. Local authorities have a responsibility to ensure enough places – but the government has a “presumption” that new schools should be free schools or academies, outside of local authority control. This has raised questions about whether the political investment in free schools is at odds with the strategic need to meet the demand for places. Mr Simmonds, a Conservative, says councils should work with potential free school providers and that there should not be any delays as a result. But he says it is clear that tackling this places shortage is going to be a priority. “For the next five years, almost all the capital spending will be on primary places,” he said. A spokesman for the Department for Education said: “We’re creating thousands more places to deal with the impact of soaring birth rates on primary schools. We’re more than doubling targeted investment at areas facing the greatest pressure on numbers – over£4billion in the next four years.